In our family we make the Thanksgiving feast again for Christmas. As I made myself a turkey sandwich from the leftovers this afternoon I pondered it and felt compelled to comment. I find it fascinating that the simple and humble turkey sandwich is probably as beloved as the dinner from which it descends, maybe even more so. It's also interesting to me that, when discussing Thanksgiving dinner, people almost reflexively mention the leftovers. At the top of the list of leftover plans is almost always the sandwich. Most folks like to keep theirs simple with mayo, tomato and lettuce. I like to add baby swiss to mine. As for bread, my favorite is Classic Black. It's hearty, dark brown, and slightly sweet. It's sort of like a more dense version of the rolls they serve at Outback Steakhouse. 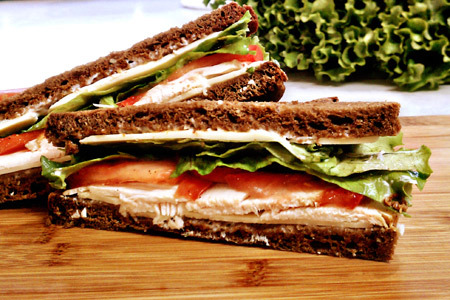 I think that the simple turkey sandwich might just be the second best sandwich ever -- next to the Reuben, of course. Note: Please excuse the cell phone picture. Love a good turkey sandwich...and I agree, I think I might look forward to the leftovers, more than the actual turkey dinner. We add a couple of slices of apple-smoked bacon, some avocado, and a nice 12-grain, to our turkey sandwich...yum! I'm gonna have to go against the grain on this one. I'm just not a big turkey sandwich fan. It may be because we seriously burnt ourselves out on turkey over the last 5 years. Although I will agree that the Reuben is one of the top 5 sandwiches out there. This post has the possibility of turning into a nice little debate as I'm sure everyone has a favorite sandwich. P.S. - How are we defining sandwich?